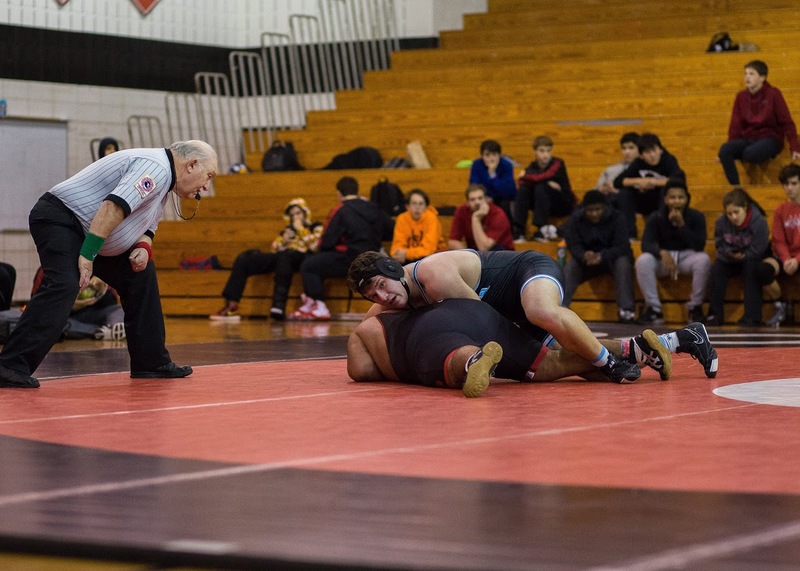 Whitman traveled to Quince Orchard High School in Gaithersburg for our first away wrestling tournament. The big surprise of the evening was the scale at QO, which unfortunately seemed to be delivering weights over a pound heavier than our home scale at Whitman. This resulted in four of our Varsity grapplers not being able to make weight which caused us to shift weight classes and our strategy around a bit. This contest started at 220 with Yussef Zaki who quickly pinned his opponent in the first period. Tom Wilmarth was up next at 285. Tom’s match proved to be a lot tougher as he was giving up 30 to 40 pounds to his opponent. However Tom managed to grind away at his much larger opponent and the match ended up with Tom on top with a commanding 7-3 win. We then had to forfeit the 106 weight class. Following the forfeit we then lost the next three battles at 113, 120, and 126 (to a first ranked opponent) bringing the score to a 9-24 deficit. Things looked bleak until Matthew Lindstrom made his presence felt at 132 with a first period pin. Clark Boinis then followed suit with a punishing performance at 138 as he dragged his fleeing opponent back onto the mat and pinned him in the first period with a barbed wire. Colby Fong was up next at 145 and lost to a fall in the second period to another first ranked opponent. Sang Hanna then stepped up at 152 and turned in a gutsy 4-0 win that went the distance. It was then John Mackall’s turn at 160 who overpowered his opponent and carded a second period pin to bring the score back to all even at 30-30. 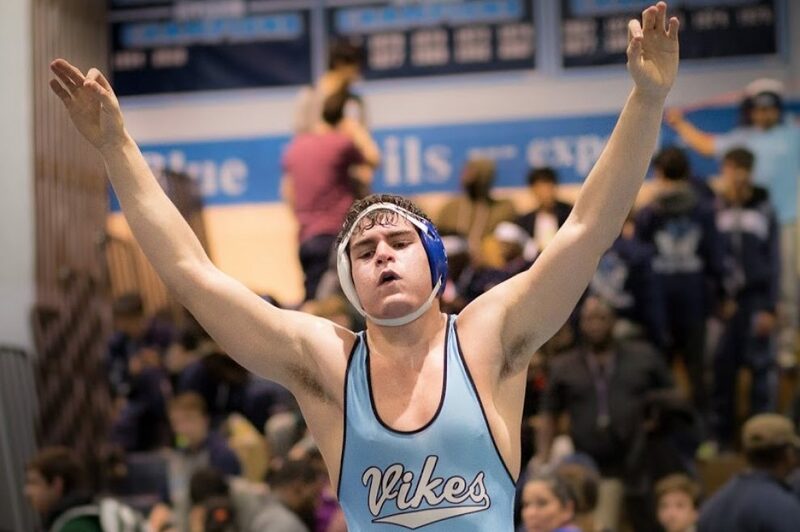 John’s points turned out to the last of the evening for the Vikes as we then lost the 170, 182 and 195 matches. The final score was Whitman 30 and QO 45. Although this was a loss the result was more favorable than last year when we faced off against the Cougars and lost 20-47. The JV matches that followed showed the type of depth our Varsity team has behind it. There were 11 JV matches in all with Whitman winning all 11 of them for a final JV score of 47-0. The victorious JV wrestlers were Nick Roy, Logan Glazier, Charlie Imperial, Fernando Karamanoglu, Stephanie Solloso, Jack Morris, Danylo Hartzler, Ben Mickum, Sean Mitchell, Will Macdonald and Neil Parikh. Great effort by all the JV wrestlers who sent a message to QO with their shut-out victory!